This PDF 1.7 document has been generated by Adobe InDesign CS5.5_J (7.5.3) / Adobe PDF Library 9.9, and has been sent on pdf-archive.com on 24/12/2015 at 15:40, from IP address 5.18.x.x. The current document download page has been viewed 365 times. File size: 3.2 MB (8 pages). measurement function. 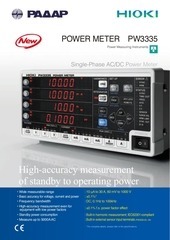 All three units are designed with emphasis on measurement speed and safety. functions that help minimize tact time in production lines. For details, see page 2.
minimize sample degradation when measuring resistance. 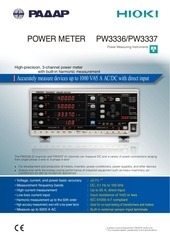 V DC, and measurement current never surpasses 100 µA DC. For specifications, see pages 5 and 6. Sampling speed Values in the ( ) show samples/second. * Approximately 55 ms required for self-calibration at 30-minute intervals. 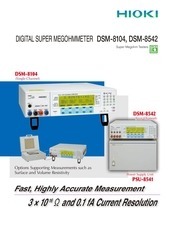 Does not apply at resistances higher than 2MΩ, or LPΩ higher than 200kΩ (see page 5). For the 3238 and 3239's frequency function gate time, see page 5. 10 Hz to 300 kHz, and AC current of 10 Hz to 30 kHz. For details, see page 3. ✓ DC V basic accuracy: ±0.01% rdg.±2dgt. ✓ DC V basic accuracy: ±0.025% rdg.±2dgt. at the top right of page 1.
conditions for various range and comparator values. result (see T2 in the figure above). Please inquire regarding compatibility with the command sets of other manufacturers. ■ The printer can also be controlled using a foot switch. can also connect a foot switch to the external I/O TRIG terminal. CABLE 9444 and a AC ADAPTER 9443 to connect it to the DMM. The unit uses self-regulation to suppress drift. and display current values simply by selecting a range. ± 2 % rdg. ± 1 % f.s. ± 1.5 % rdg. ± 0.1 % f.s. ± 3 % rdg. ± 0.2 % f.s. Select the 20 A range. DMM (dgt.) ✕ 10 (dgt.). For the AC V accuracy of the DMM, see page 6. In addition to the sensors described above, you can also connect the 3283, 3284, 3285 (requires the 9094) Clamp On HiTesters, and the 9277, 9278, 9279 (requires the 9555-10) DC Sensors. 200 Ω 1 mΩ 199.999 Ω Appox. 1 mA 6V DC max. 2000 Ω 10 mΩ 1999.99 Ω Appox. 1 mA 6V DC max. 20 kΩ 100 mΩ 19.9999kΩ Appox. 100µA 6V DC max. 2000 kΩ 10 Ω 1999.99kΩ Appox. 1 µA 6V DC max. 20 MΩ 100 Ω 19.9999MΩ Appox. 100nA 6V DC max. 100 MΩ 1 kΩ 100.000MΩ Appox. 20nA 6V DC max. 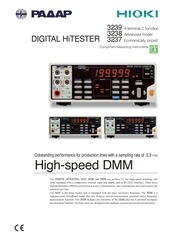 For fast sampling in the 20 MΩ range or higher. A built-in buzzer sounds when the resistance value is less than 50.00 Ω.
Square-wave input between 10 Hz to 300 kHz, 10 V p-p. 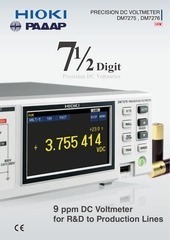 The accuracy above is standard for inputs higher than 8% of full scale (higher than 160 V for a range of 750 V). After zero adjustment. When measuring high resistance, use a shielded cable such as the 9236 CONNECTION CORD (1.7m). 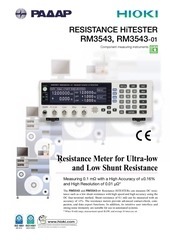 The accuracy quoted above is for a contact resistance of 100 Ω or less. ● Crest factor: 3.0 max. Approx 8.5˝ W ✕ 3.5˝ H ✕10.4˝ D, 91.7 oz. CABLE and an AC ADAPTER 9443 to connect it to the DMM. For printer specifications, see page 3. For Clamp sensors specifications, see page 4. All information correct as of Sept. 16, 2015. All specifications are subject to change without notice. This file has been shared by a user of PDF Archive. Document ID: 00326475.